As the demand for smaller, more compact control systems increases, manufacturers of printing and binding equipment turn to Pneumadyne for valve blocks and manifold systems that will provide the functionality they need. The design and manufacture of miniature pneumatic components has always been one of our specialties. When evaluating system requirements, Pneumadyne engineers are often able to consolidate components into a smaller, integrated block which eases product assembly and saves the customer time and money. Integrated designs also eliminate potential leak points and improve the overall appearance of the pneumatic circuit. Learn about a custom valve block that was developed to meet the specific requirements of an ink dispensing application. To meet the specific requirements of your application, contact Pneumadyne to discuss your pneumatic component needs. Several of our standard pneumatic components are used in applications throughout the printing industry. Miniature pneumatic valves are available in a variety of configurations and feature numerous porting options and sizes to accommodate plumbing requirements. 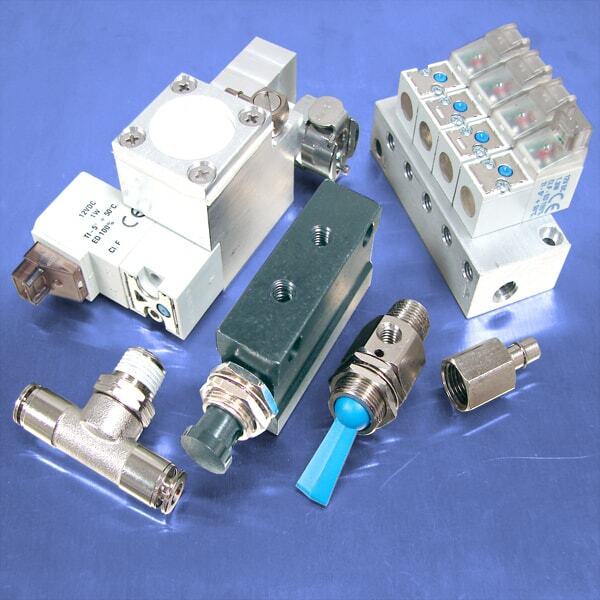 Various styles and sizes of brass and stainless steel pneumatic fittings are offered to connect pneumatic components within a circuit. Pneumadyne’s solenoid valves feature a wide range of flow rate, voltage and connector options to meet application specifications. These pneumatic products can easily be accessed below, however, our full product offering is available by clicking on the top navigation (in the gray bar).